Could you spend one night outside so others don’t have to? Challenge yourself and help us to end youth homelessness. 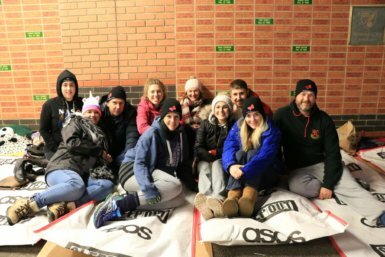 Click here to book your place at Ipswich Sleep Out 2019. We want to end youth homelessness and we’re tackling the problem locally by providing a home and support to over 100 vulnerable young adults each night. In 2017, we provided over 40,000 safe nights accommodation. We give the young people stability and support their education, training and careers and ensure they have life skills such as shopping, cooking and being able to budget their money so they can leave us to forge an independent life. Your support at Ipswich Sleep Out will help make this happen. Whether you wish to take part as an individual or in a group with friends or colleagues, you can help us to keep vulnerable young adults off the streets by fundraising and gaining sponsorship for your challenge. We recognise that Sleep Out is not the same as the real hardship faced by rough sleepers but it does give those participating the opportunity to see for themselves what it might feel like to be homeless. The event is also a great way to build awareness of the issue of homelessness in our region, whilst raising much-needed funds, which are used to deliver the work we do to tackle youth homelessness in Norfolk and Suffolk. In today’s climate of funding cuts and political uncertainty, fundraising has become more important than ever if we are to continue the work we do in this region. We’re the eastern region partner of the End Youth Homelessness partnership and each of the member charities around the UK organise Sleep Out events in November. There are 103,000 homeless young people in the UK (source: eyh.org.uk) and money raised helps prevent more young people ending up on the streets. Your fundraising at Ipswich Sleep Out will support local people. We are using Eventbrite* for you to book your place at Ipswich Sleep Out. The registration cost is £25.00 per person, plus a small Eventbrite fee. This reserves your place at your chosen event and helps us cover our costs. We can offer full time students a discounted registration cost of £10. Please contact us directly on 01603 886932 to register at the student rate. Note: These events are only open to people aged 18 years and above. *Eventbrite security information can be found here. We ask each participant to raise a minimum of £100.00 in sponsorship, in addition to the registration fee. The easiest way to do this is via Virgin Money Giving, where our charity is registered. If you’re taking part as a group, you can either set up individual fundraising pages, or a group one. – Visit Virgin Money Giving and under ‘Start Fundraising’ select ‘Create Your Page’. Virgin Money Giving will then ask you how you’re raising money. – Enter ‘Ipswich Sleep Out 2019’ and you will be able to select the event from the options provided. – You can then complete setting up your personal fundraising page to share with family, friends and colleague to gain sponsorship for your Sleep Out challenge. If you would prefer not to use Virgin Money Giving you can download a sponsorship form to raise money offline. Don’t worry if you don’t reach your fundraising target – you can still take part – and there’s plenty of opportunities to increase your total during and after the event too! Spend one night outside so others don’t have to.